Doggygirl's Dog House | If you lay down with dogs, you get up with fleas. What’s Doggygirl’s Dog House all about? Is there even one person left who has not accepted the REAL after pictures taken by Slamboard’s Private I? If you are the one person out there who doesn’t believe the REAL pictures below, please comment – I want to hear from you. Tippy?? You already know that I will publish your exact comments without editing. I’d love to know what you think. Singinglass? Lasttime4me? Anyone?? I’m glad I ended up keeping my $59.95 in my pocket. But I almost didn’t – that Red Dress Woman was a compelling draw, and Kimmer knew it. I hope that EVERY PERSON who joined the Kimkins web site – at whatever fee – joins the class action lawsuit. http://kimkinslawsuit.wordpress.com/ It’s not about getting your money back, IMO. It’s about STOPPING KIMMER and getting the money she stole from people away from her. It doesn’t cost you anything to sign up. You just have to provide proof of payment to Kimkins, and a few other pieces of information. Thanks to all of the Ducky Detectives who helped solve this piece of the puzzle. Now I am going to blog something about dogs, just to ground myself! There is Just NO Honesty in Scamming These Days! 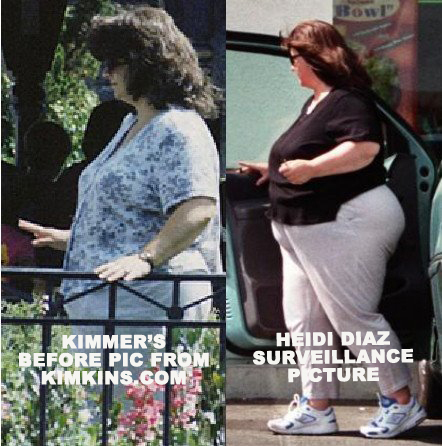 One of the most tragic things, in Doggygirl’s opinion, about KimScam is the fact that Hidey Kimmer (Heidi Diaz) was willing to put people’s health at risk while happily separating them from their money. And that is NO JOKE and not a laughing matter at all. And I hope that the class action lawsuit along with other investigations separate Hidey Kimmer Heidi Diaz from EVERY penny she took from people. While the wheels of justice turn – and that can take time – laughter is good medicine in Doggygirl’s opinion. **Disclaimer** this is an attempt at comic relief from the KimScam drama. Use the comments feature to rate this attempt from 1 star (I will never smile again – you better stop it before you totally ruin my life) to 5 stars (it made me giggle – but don’t tell anyone). I report, you decide. This is a direct copy from a comment Tippy made today, several stories down, in the Dog House. No editing. Thank you Tippy for being brave enough to write us here at the Dog House. Tippy: “This is my comment on the Kimkins Heidi Diaz subject. None of us knows who Kimmer really is for sure. But if she is Heidi Diaz then she would not be the first person to gain weight and not admit to it. Take a good look at the current admins at LCF. And read this carefully. I went to a gathering and they all looked pretty good! I was inspired by the before pics they all shared. After that gathering I stopped losing weight on Atkins diet. The admins did encourage me to stick it out, add this, take that out, ect. I did listen to them and tried it all. The stall would not break. Still, I kept thinking how slim they all were at the gathering and how much I respected the opinions and suggestions given. I waited for 6 months and the stall never broke. Soon after I found Kimkins and it worked beautifully. Gathering #2 came and we went. This time I was nearly in shock. The very same admins who were giving me advice and telling me NOT to use Kimkins had regained a lot of weight back. (Not all but most had) Worse, many never changed stats or removed the “after” pics either. I wanted to cry. I had believed them… And yes I did take pics at both gatherings and no I will not show them. I will not be taking the same path as the haters. That would be wrong. Does Kimkins work? You bet your arse it does! I see successful people in there every single day. They bought a membership for a diet in order to lose weight and that is exactly what they are getting. They did not buy a membership to pry into anyone’s private and personal life. I personally have lost over 60lbs doing Kimkins and am damn proud of it. We all are proud to be losing weight and feeling great doing Kimkins. So…..Tippy? I still have no clue about how and why you made the move to Kimkins.com. Never mind…..
Dr. Pescatore, We Want To Hear From You. Since writing yesterday regarding your seeming endorsement for Kimkins.com, I have re-visited the 6/12/07 Woman’s World article. Dr. Pescatore’s name is mentioned 4 times, the “Hampton’s Diet” once, and www.hamtonsdiet.com once – all in a way that looks like Dr. Pescatore endorses the Kimkins.com diet. Dr. Pescatore, do you endorse the Kimkins.com diet? Please just answer that question – there are lots of people who want to know the answer. After reviewing the Woman’s World article, all I can say is….Please Pass The Barf Bag. Dr. Pescatore, it wouldn’t shock me at all if you were never interviewed for that article. Creative writing was certainly involved. WE INVITE YOU TO SPEAK OUT. And at this stage, I think it looks bad if you don’t. Kimmer, Heidi Diaz, or any Authorized Kimkins.com Representative is Invited to Respond! I have e-mailed the webmaster at Kimkins.com inviting Kimmer, Heidi, or any authorized representative of Kimkins to respond to me either by e-mail or phone to the KTLA news story. I have offered to publish both sides. I will let you know if Kimmer, Tippy Toes, Singing Lass, or any others come forward with a different point of view. Kimmer? Tippy? Singinglass? Lasttime4me? Other Admins? I will print exactly what you have to say. Come forward! Yesterday evening KTLA News in Los Angeles featured a segment exposing the Kimkins fraud. Stay tuned tonight for part 2, with more information about the lawsuit. Back to Kimkins – Who is Dr. Pescatore? Schutzhund Obedience 2004 – aka – When I Fell In Love With The Sport! What the Sam Hill is So Special about German Shepherd Dogs Anyway? Vickie’s Voice: …more of my story..
Doggygirl’s Dog House · If you lay down with dogs, you get up with fleas.